Novelist Kenzaburo Oe delivered a scathing critique of the refusal of Prime Minister Shinzo Abe and other Japanese political leaders to acknowledge the country’s past actions. The remarks came while the 81-year-old author was attending the Yonsei-Kim Dae-jung World Future Forum, an event staged by Yonsei University and the Kim Dae-jung Presidential Library and Museum at the university‘s Baekyang Concert Hall on Mar. 13 to mark the 130th anniversary of the school’s foundation. The novelist, who was awarded a Nobel Prize in Literature in 1994, was in South Korea at the invitation of Kim Dae-jung Peace Center chairperson and former First Lady Kim Hee-ho. “As part of the postwar generation, I developed all the sensibilities in my work while imagining a new society after the war in my teens and twenties,” Oe recalled. “Abe wants to forge a new era by rejecting all the efforts Japanese society made to achieve something democratic and humane in the ten years after the war,” Oe said of the administration. “The bigger problem is that over half of the Japanese public is sending votes of support to the administration,” he added, sounding a note of concern about the strong approval Abe enjoys at home. “The crimes Japan committed against Asia, and the people of the Korean Peninsula and Korea in particular, were truly atrocious, and I don’t feel that Japan has apologized enough for them,” Oe said. 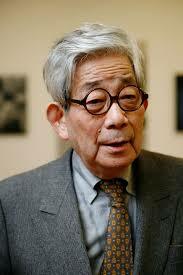 Oe, who published his first book in 1958, is one of the leading writers and pacifists of Japan’s postwar era. Awarded the Nobel Prize in 1994 for works such as “The Silent Cry”, he has been a consistent voice against the Abe administration’s militarization and nuclear power in the wake of the 2011 East Japan earthquake and tsunami. “Our future now hinges on forging a new sensibility in individuals. I will spend the last of my days pleading and thinking on those lines,” he continued.